So we turn right, into the hidden driveway? 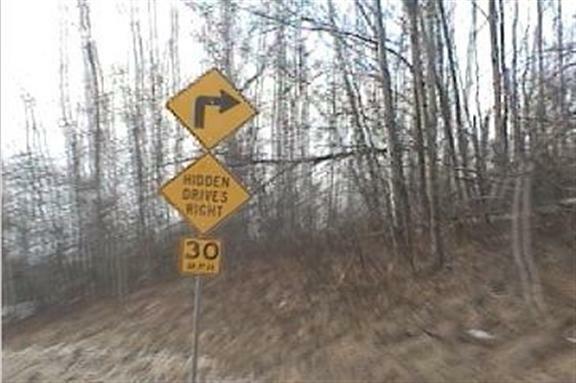 Also the recommended speed is 30mph, so drivers probably come around this bend at about 40 or 45 mph in reality. Still fast enough for a horrible accident. Hidden driveway signs are wastes. If you're barreling around a corner, a hidden driveway sign isn't going to slow you down, because everyone knows that driveways usually handle very small numbers of cars each day. I guess this sign is still MUTCD compliant though, even though it shouldn't be.